Generally, most shark species avoid people. 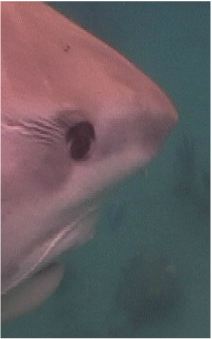 Negative interactions between sharks and humans are usually instigated by humans. Sharks throughout the world are essential to the ocean's ecosystem health. Without the shark's contributions, vast areas of the ocean would be in imbalance. Ecosystems that are out of balance will have larger populations of predators or prey. If prey are in abundance, predator populations will grow until the prey populations can't support the increased predators. This will cause a decline in predators, thereby increasing prey. Although, if predator or prey populations are in large decline, population numbers won't bounce back to be sustainable and will collapse. This is what causes declines in population densities and distribution. Which leads to endangered or extinction scenarios.